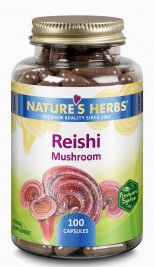 Reishi Mushroom - 600 mg, 100 capsules (Nature's Herbs) - Penn Herb Co. Ltd.
Reishi Mushrooms have been used in China for at least 2,000 years and is known as Ling-zhi. Today, many have used Reishi Mushroom as an adaptogen and for immune support. Includes Bioperine® Black Pepper Extract for added performance! AMOUNT PER SERVING (2 CAPSULES): Reishi Mushroom 1,200 mg, Black Pepper Fruit Extract (Bioperine®) 1.7 mg. OTHER INGREDIENTS: Gelatin, Medium Chain Triglycerides, Vitamin E and Rosemary Oil (as preservatives). Use only as directed. Take 2 capsules daily. Store in a cool, dry place. KEEP YOUR LICENSED HEALTH CARE PRACTITIONER INFORMED WHEN USING THIS PRODUCT.